under вЂњNoticesвЂќ on page 67. 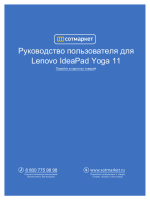 В© Copyright Lenovo 2012. All rights reserved. delivered pursuant a General Services Administration вЂњGSAвЂќ contract, use, reproduction, or disclosure is subject to restrictions set forth in Contract No. GS-35F-05925. 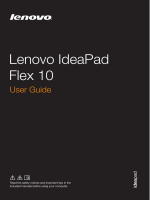 Use this manual to troubleshoot problems. information required for servicing computers. 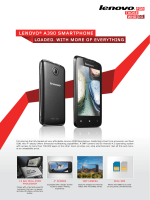 Lenovo products. 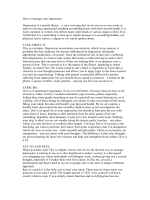 Use this manual to troubleshoot problems effectively. 1. Make sure that you can stand safely without slipping. 2. Distribute the weight of the object equally between your feet. and the customer are not in a hazardous position. personnel, while you are servicing the machine. elbows. If your hair is long, fasten it. nonconductive clip, about 8 centimeters (3 inches) from the end. Attention: Metal objects are good electrical conductors. that may be hazardous to your eyes. вЂў After service, reinstall all safety shields, guards, labels, and ground wires. Replace any safety device that is worn or defective. вЂў Reinstall all covers correctly before returning the machine to the customer. Observe the following rules when working on electrical equipments. working with live electrical currents. kind of mat to protect yourself from electrical shock. switch or unplug the power cord quickly. power to the machine, and to lock the wall box in the off position. keep the other hand in your pocket or behind your back. leads and accessories for that tester. you from grounds such as metal floor strips and machine frames. information. Be extremely careful when you measure the high voltages. вЂў Do not use worn or broken tools and testers. to make sure that it has been powered off. surges, and missing safety grounds. вЂ“ Use caution: do not become a victim yourself. вЂ“ Switch off the power. вЂ“ Send the victim to get medical aid. covered by this inspection guide. the power off, and the power cord disconnected. 1. Check exterior covers for damage (loose, broken, or sharp edges). 2. Turn off the computer. Disconnect the power cord. ground pin and the frame ground. b. The power cord should be the type specified in the parts list. c. Insulation must not be frayed or worn. 4. Check for cracked or bulging batteries. safety of any non-Lenovo alterations. contamination, water or other liquids, or signs of fire or smoke damage. 8. Check for worn, frayed, or pinched cables. person handling the part are all at the same charge. (ISO 9000) as fully effective. вЂў Keep the parts in protective packages until they are inserted into the product. вЂў Avoid contact with other people. retains a charge even when you are wearing a wrist strap. surface. The mat is especially useful when handling ESD-sensitive devices. that meets the specific service requirement. вЂ“ Attach the ESD ground clip to any frame ground, ground braid, or greenwire ground. ESD common ground or reference point. You can use coax or connectoroutside shells on these systems. вЂ“ Use the round ground prong of the ac plug on ac-operated computers. Hebrew, Italian, Japanese, and Spanish. rattling sounds. Metallic parts or metal flakes can cause electrical shorts. geschГјttelt und auf KlappergerГ¤usche geprГјft werden. Metallteile odersplitter kГ¶nnen KurzschlГјsse erzeugen. metГЎlicas pueden causar cortocircuitos elГ©ctricos. incorrect battery can result in ignition or explosion of the battery. risque de prendre feu ou dвЂ™exploser. nur Batterien des Typs verwenden, der in der Ersatzteilliste aufgefГјhrt ist. Der Einsatz falscher Batterien kann zu EntzГјndung oder Explosion fГјhren. no apropiada puede provocar la igniciГіn o explosiГіn de la misma. lвЂ™incendio o lвЂ™esplosione della batteria stessa. apropiada puede provocar la igniciГіn o explosiГіn de la misma. in ignition or explosion of the battery. der zur richtigen Polung angebrachte Verbindungsstecker entfernt werden. Bei der Entsorgung die Г¶rtlichen Bestimmungen fГјr SondermГјll beachten. anschlieГџend ein Arzt aufgesucht werden. medico se i sintomi dovessero permanere. sГ­ntoma del fluido despues de lavarse. plastique protГ©geant la partie infГ©rieure de la carte dвЂ™alimentation. avvolge la parte inferiore della scheda invertitore. can produce enough current to burn personnel or combustible materials. zu entzГјnden oder Verletzungen bei Personen hervorzurufen. combustibili o provocare ustioni ai tecnici di manutenzione. courant, retirez la batterie et dГ©connectez tous les cordons dвЂ™interface. bevor eine FRU entfernt wird. cualquier cable de conexiГіn entre dispositivos. 825 for Class 1 laser products. those specified herein might result in hazardous radiation exposure. daqueles aqui especificados pode resultar em perigosa exposiГ§ГЈo Г radiaГ§ГЈo. de rГ©glage et dвЂ™utilisation des commandes, ainsi que les procГ©dures dГ©crites. quelle specificate possono provocare lвЂ™esposizione a.
aquГ­ especificados puede provocar la exposiciГіn a radiaciones peligrosas. serviceable parts inside those drives. Do not open. directement avec des instruments optiques, ou de vous exposer au rayon. Instrumente in den Laserstrahl sehen und den Strahlungsbereich meiden. eszkГ¶zГ¶kkel. KerГјlje a sugГЎrnyalГЎbbal valГі Г©rintkezГ©st! Гіptico el haz de luz. Evite la exposiciГіn directa al haz. before replacing any FRUs listed in this manual. system board before completing the service action. 3. Select the BIOS/Driver/Applications and download. 4. Follow the directions on the screen and install the necessary software. the problem, reinstall the original FRU before you continue. the problem, reinstall that board, and then replace the other one. when service has been completed, verify that those settings remain in effect. has a current backup of the data before performing this action. вЂў Do not drop the system board or apply any excessive force to it. вЂў Avoid rough handling of any kind. each BGA (Ball Grid Array) chipset. identified with unique FRU part numbers. product Lenovo produces containing RoHS compliant FRUs. HMM or direct substitutions for those FRUs may be used. automatically shipped by the distribution center at the time of the order. вЂў Only certified trained personnel can service the computer. вЂў When you replace FRUs, use new nylon-coated screws. or programs might be overwritten. number are correct by referring to the FRU parts list. вЂў Be careful not to replace a nondefective FRU. improper maintenance by the customer. to stress beyond normal use. вЂў Missing parts might be a symptom of unauthorized service or modification. to excessive force, or dropped. You are here because the computer fails only when the AC adapter is used. adapter for correct continuity and installation. 1. Unplug the AC adapter cable from the computer. 3. If the voltage is not correct, replace the AC adapter. вЂў Replace the system board. 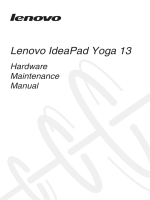 вЂў If the problem persists, go to вЂњLenovo IdeaPad Yoga 13вЂќ on page 27. Note: Noise from the AC adapter does not always indicate a defect. power remaining when installed in the computer. reinstall the battery pack. If it is still not charged, go to the next section. from having a shortened life. about the battery, double-click the Power Meter icon. down, reinstall and recharge it. computer to the original factory configuration. This disc is used to format the hard disk drive and initiate the recovery process. This disc restores the Microsoft Windows operating system. This disc restores the pre-installed applications and drivers on the computer. disc sets come with a Supplemental Recovery Disc. 1. Insert the bootable Start Recovery Disc into the optical drive. instructions to begin the recovery process. conditions and then click Next. begin the operating system recovery process. click OK to begin the applications and drivers recovery process. Yes. If you do not have a Supplemental Recovery Disc, click No. disc and restart the computer. apparent on the screen for several minutes at a time. This is normal. when the operating system is booted. from the hard disk drive. The hard disk drive can be replaced for a scheduled fee. Setup Utility and change the system configuration. must be replaced for a scheduled fee. Note: Power management modes are not supported for APM operating system. modes: screen blank, sleep (standby), and hibernation. вЂў Close the display panel. вЂў Press the power button. means that the computer has entered an enhanced power-saving mode. вЂў Press the Windows button. The battery has more than 20% charge. The battery has between 5% and 20% charge. reaches 20%, the blinking color changes to white. continue until the battery is fully charged. The computer is powered on. The computer is in sleep mode. The computer is powered off. appropriate hotkey, you can change system settings instantly. The following describes the function of each hotkey. Displays all currently active apps. Turns on/off the backlight of the LCD screen. 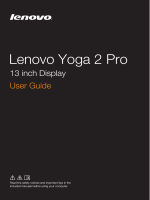 select this notebook or an external display. section carefully before replacing any FRU. вЂў They maintain tight connections. вЂў They do not easily come loose, even with shock or vibration. вЂў They are harder to tighten. вЂў Each one should be used only once. вЂў Keep the screw kit in your tool bag. вЂў Always use new screws. вЂў Use a torque screwdriver if you have one. If you have a torque screwdriver , refer to the вЂњTorqueвЂќ column for each step. certified. An untrained person runs the risk of damaging parts. 2. Before replacing any FRU, review вЂњFRU replacement noticesвЂќ on page 31. 3. Begin by removing any FRUs that have to be removed before the failing FRU. figures by the numbers in square callouts. the arrow in the figure. and arranging internal cables, see вЂњLocationsвЂќ on page 56. 8. When replacing an FRU, use the correct screw as shown in the procedures. (P/N 6405959) to remove potential shock reasons. the keyboard a little in the direction as shown by arrow b .
shown by arrows d e .
When installing: Make sure that the FPC connector is attached firmly. Remove two screws a three screws b and ten screws c on the bottom. the touchpad connector in the direction shown by arrows e f.
Remove the keyboard bezel in the direction shown by arrow g.
other battery could ignite or explode. Remove the battery in the direction shown by arrow c.
When installing: Connect the battery last. Remove the dummy card in the direction shown by arrows a b .
fixed in the slot and difficult to be moved. Remove the card in the direction shown by arrow b.
screws b and six screws c .
d. Be careful not to damage the connector. When handling the system board, bear the following in mind. surface, such as metal, wood, or composite. вЂў In the whole process, make sure not to drop or stack the system board. surface such as an ESD mat or conductive corrugated material. Remove three screws a .
arrow e , IO board connector in the direction shown by arrow c .
When installing: Make sure that all the connectors are attached firmly. Remove the system board in the direction shown by arrow g.
and make sure that they are attached to the holes on the base cover as shown. Improper placement of those jacks might cause a damage. cables to be damaged by the cable guides, or a wire to be broken. the LCD cable along the cable guides. Detach the LCD unit from the upper case in the direction shown by arrows b. Remove the power assembly in the direction shown by arrow c.
When installing: Make sure that the power connector is attached firmly. the rotation button board connector in the direction shown by arrow e.
power board in the direction shown by arrow j .
them in the direction shown by arrows. Notes: wireless LAN card has 2 cables in step a . Remove the card in the direction shown by arrow c .
The new base cover FRU is shipped with a kit containing labels of several kinds. adhere them to the new one. stating the original label part number, serial number, and product key. attached on the part you are servicing. Remove two screws a . Remove the LCD front bezel in the direction shown by arrow b .
exploded view in вЂњOverallвЂќ on page 60.
give you any license to these patents. illustration. The result obtained in other operating environments may vary. Lenovo product, and use of those Web sites is at your own risk. The following is a trademark of Advanced Micro Devices, Inc.